Envoy B2B V16 Quarterly Update - Activity & Insights, Assortment Campaigns, And More! We’ve released the latest quarterly update to Envoy B2B with a plethora of exciting new features, performance enhancements, and fixes. Read on to discover what’s new in Envoy B2B. The Activity & Insights dashboard is now the new landing page for internal users ( Reps, CSRs, Admin ) after login. 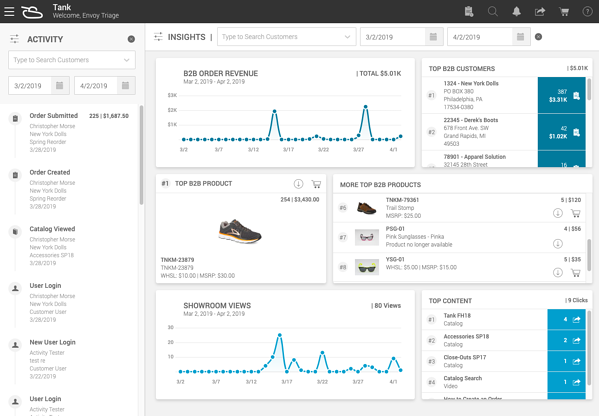 This dashboard provides internal users with the ability to quickly view analytics on top products, content interaction, showroom views, B2B order revenue, and top customers. These insights allow sales reps to utilize data to further the conversation with their customers, and provides admin users with the knowledge of how to maximize showroom and content dashboards. Additionally internal users can see real time activity of retailers in the platform. Activity like users logging in, orders being created and submitted and content being viewed. Please note that segmentation rules apply and sales reps will only be able to view their customers. Assortment campaigns empower you to send an assortment to many buyers in one simple workflow. 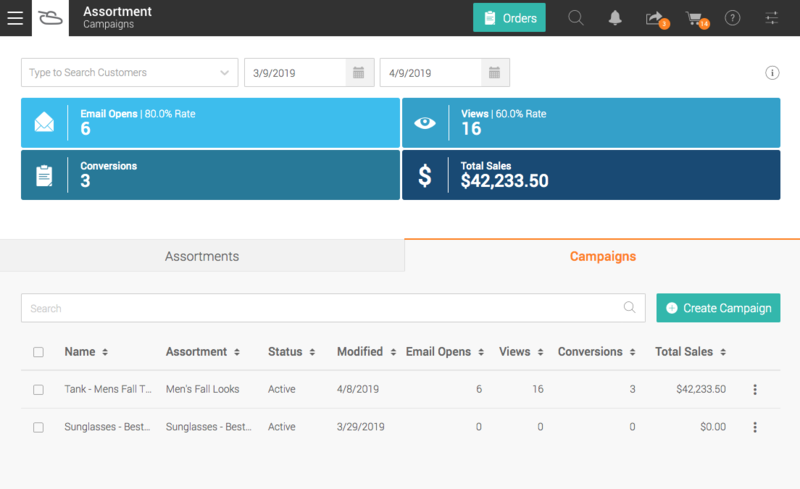 We track email opens, assortment views, and conversions into orders so you can clearly see what is performing and what is not. Assortment campaigns are great for pushing promotions and new product introductions. Campaigns can be sent to single or multiple customers and take over the functionality of customer assortments. A New Order button in the top toolbar. The white plus icon in the header for creating orders has been removed. Now, a new order button and dropdown menu has been added to the right side of the header. 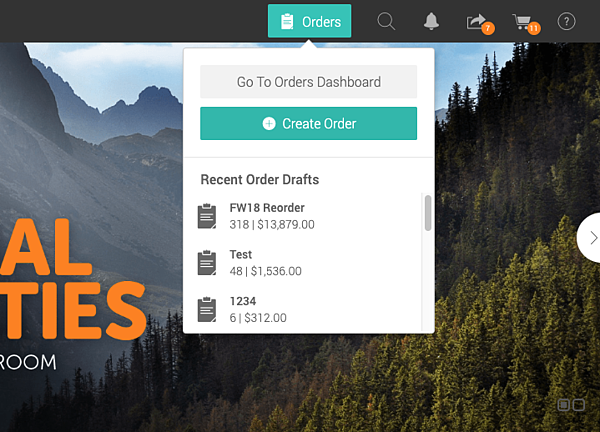 When you click on the icon, a dropdown menu displays with the ability to create an order, view the orders dashboard, and quickly access your recently created order drafts. We’ve got a new cool way to display products while buyers shop. This view consolidates all colorways into one product object, greatly minimizing the number of products that display in a catalog and providing a slick way to browse colorways. A new content dashboard makes accessing catalogs, files, presentations, etc., much easier for all users. The content dashboard is quickly accessible from the menu. Showroom is our new home for buyers. We now land buyers directly in showroom to provide the most easy and friendly experience to get to know your brand and place an order.For your customers, the showroom dashboard now replaces the home dashboard as the landing page. The home dashboard has been removed from the site. A new notification icon and dropdown on the site header displays notifications when items have been shared. Now it’s hard to miss anything important, like it should be! On assortments, the star icon has been replaced with the add to cart option. This functionality is also present on the assortment campaigns shared with customers. When multiple size systems are present, the size system selector on the order edit and inventory pages has been moved out of the settings and is now accessible with one click. 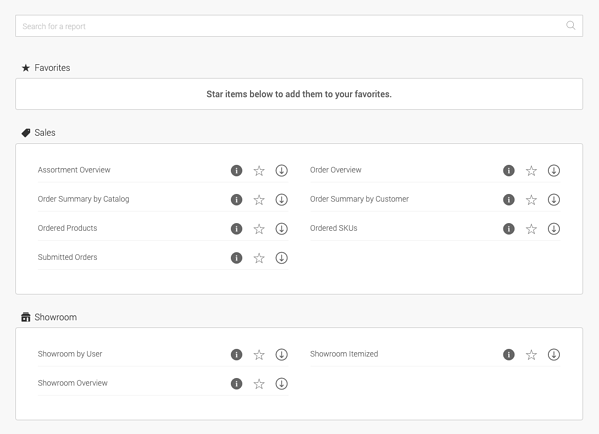 When creating an order or assortment there is now an "Add Products" button on the page. It was a bit confusing for new users, and now this button will add some clarity. 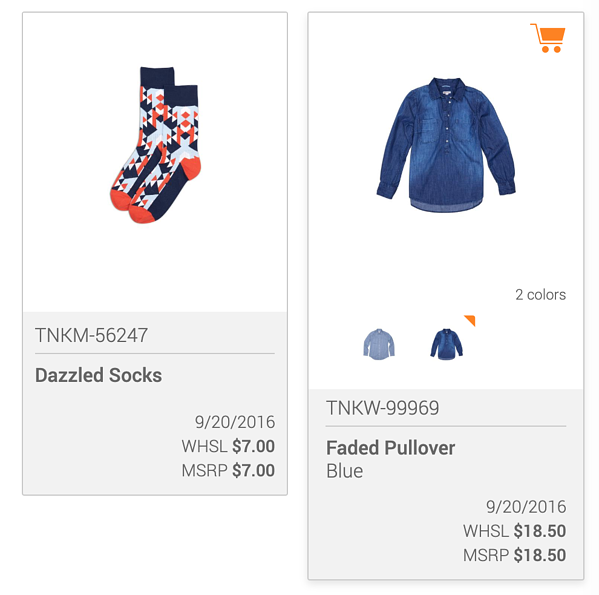 A new option is available in the catalog settings to display product colors together. When enabled, the first color within a colorway group is displayed as the default image. We've updated the reports dashboard UI making it easier to use. We have reorganized all the reports by kind, and now you can favorite you frequently used reports to quickly access in the future. Subscribe to the Envoy B2B blog! Envoy B2B is a wholesale content and eCommerce platform for your entire team. Our tools and services are designed to help you create dynamic content, increase your speed of sale, and bring you closer to your retailers. Envoy B2B provides the technology you need to empower your team and support your retail channel.